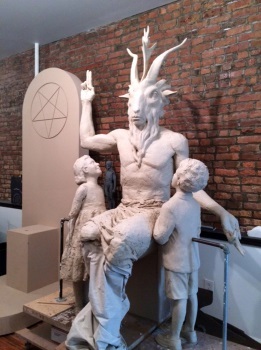 The Satanic Temple's seven-foot-tall Baphomet statue, complete with beatific children gazing at it lovingly, is just about ready to take its place on the Oklahoma Statehouse lawn. The state of Oklahoma placed a monument to the Ten Commandments on the lawn of its capitol building in 2012, leading the New York-based Satanic Temple to apply for permission to place a monument of its own, on the basis that the government must treat all religions equally. By allowing a Christian monument on the grounds, it argued, the legislature opened the door to the placement of similar monuments to other religions. It's a silly idea, but the Temple took it to crowdfunding site Indiegogo and the internet, as it does, ran with it, raising more than $28,000 of a $20,000 goal. And while Oklahoma quickly took steps to shut down the effort by suspending the approval of all such permits, the Satanists are building the statue anyway. What they've come up with so far is actually pretty fantastic. The Baphomet itself is impressive and imposing, but it's the children that really sell it: You can almost see the rapturous joy on their faces as they gaze up at the fearsome visage of the Dark Lord Lucifer. And while dropping something like this on the lawn of a state legislature in the middle of the Bible belt might seem like asking for trouble, the Temple has that base covered too: It's making a mold of the statue so it can produce replacements as needed. "Depending on our insurance policy, we may be able to cast two from the destruction of one, expediting our arrival to the next battleground," Temple rep Lucien Greaves told Vice. There are plenty of other such "battlegrounds" to consider if Oklahoma ends up removing the statute of the Ten Commandments, he added. "There are no shortage of public locations across the U.S. were religious monuments await a contrasting voice." Destroy one and two will arise - that sounds rather appropriate, doesn't it?